I made the first photo out of one of the upper level windows in our home as it was raining fairly hard outside. 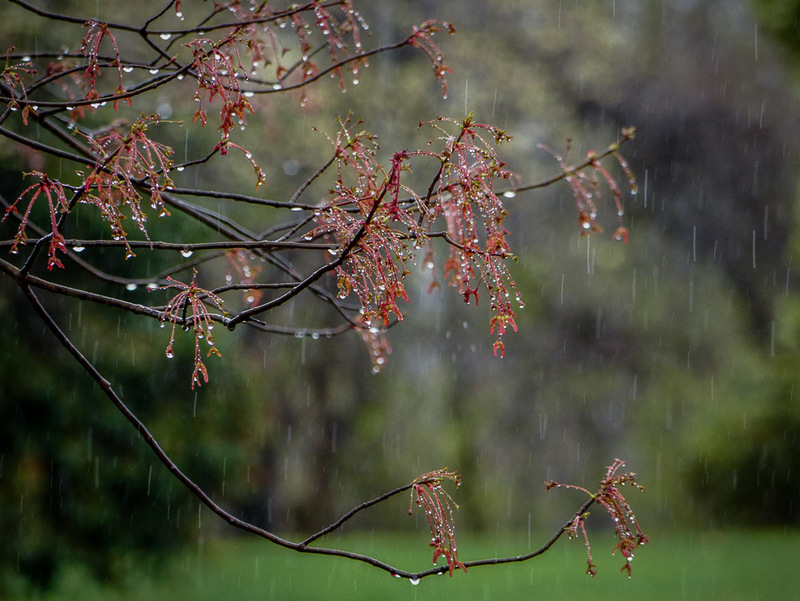 I liked the way the rain drops were forming on newly opened tree buds, soon to turn into nice green leaves. 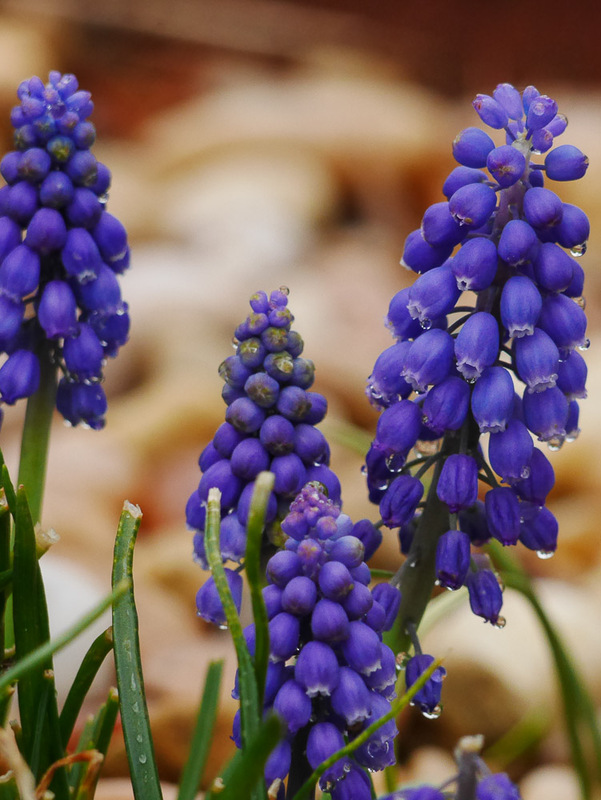 After the rain stopped, I went out in the front yard and took the last two shots of small, but very beautiful, Grape Hyacinth flowers which pretty much grow wild all over our yard at this time of year. The ones seen here are underneath our street-side mailbox, in the middle of a smooth, colorful river-rock garden. 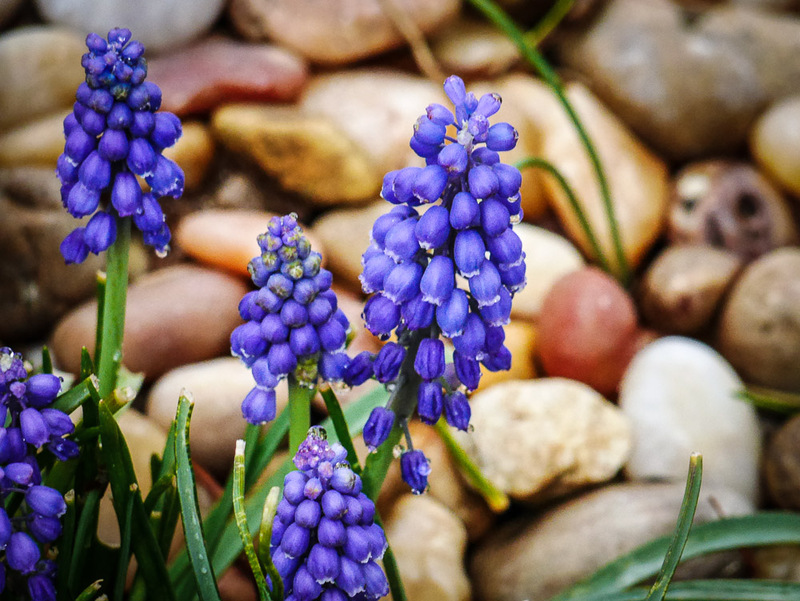 I wanted to capture the wet, smooth appearance of the rocks in the background behind the purple flowers, each flower bunch being about 1-2 inch high. To get that look, I used my telephoto lens and stood far enough back to keep the flowers in sharp focus, and to make the background blurred. In photography circles, that effect is called “bokeh”, from the Japanese word “boke” which means blur. It’s pronounced as follows: Bo (as in bow), Ke (as in the first part of kettle). Pronounced as two separate words, “Bo Ke.” So now you’ve learned some photo community trivia. Nice images. I like the raindrops! I teach in my workshops to go out and shoot when other photographers stay inside. Even though you was inside you got a great rainy image.